(Rating: 0 / 0 votes) Limitations or 40 uses. SalesCycle CRM is a multi company, multi currency customer care system that combines a variety of functions with a simple menu driven and easy to use design at a fraction of the price of comparable systems.. It is the ideal system for owner and managers of small to medium sized businesses. As your business grows, it can be expanded to multi user mode through the installation of a downloadable Server Pack and can be integrated to Artemis Accounts II for full accounting functionality. Features include . . 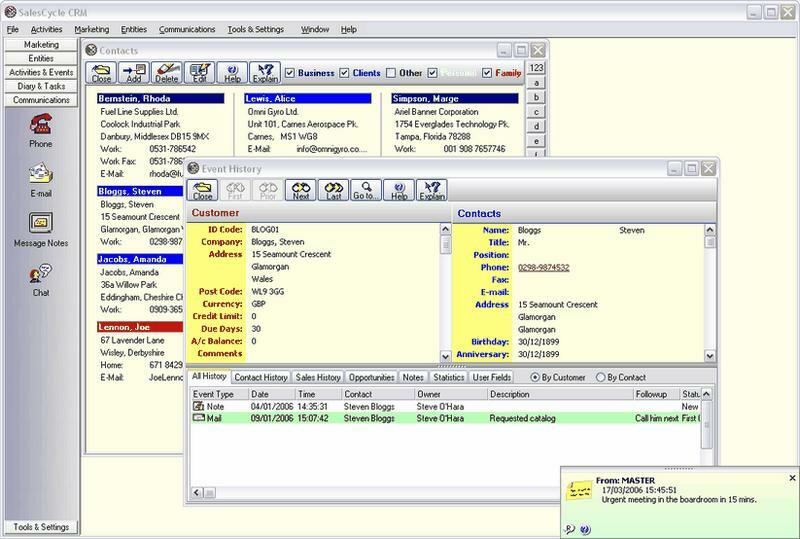 Fully integrated 32 bit Windows system... Multi company and multi currency as standard...Campaign Management...Forecasting...Sales Funnel...Diary, To-do List, and Contact List...Sales Invoicing... Customer Payments...Integrated Email...Team Chat...Message Notes.. Full password security control Integrated one click backup and restore... Up to 10 VAT or Sales Tax codes, .. Creates truly professional invoices on plain paper and also accommodates pre printed stationery... Electronic Invoicing. . . etc.